I have featured my dad so many times on my blog I should start paying him. He graciously shared how to make traditional Italian pepper biscuits and pizzelles. He even not-so-graciously demonstrated how to crack the shell of a mammoth 14-pound lobster (the guy's got good biceps). Today he's back to show you how to make limoncello, the uniquely refreshing lemon Italian liqueur. Limoncello is not difficult to make, but you have to plan ahead; the lemon and orange rinds need to soak for 48 hours. Give yourself 3 days -- 2 for soaking and 1 for the processing and freezing. The actual hands-on time is short, so don't be scared. Plus once you taste that tantalizing sweet-tart lemon, you won't care how long it takes to make. It's like Del's lemonade for adults (that's for my RI readers). 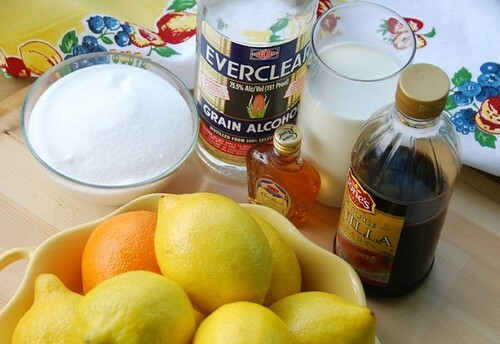 Gather all of your ingredients: pure alcohol, milk, whiskey, vanilla, sugar, lemons, and oranges. 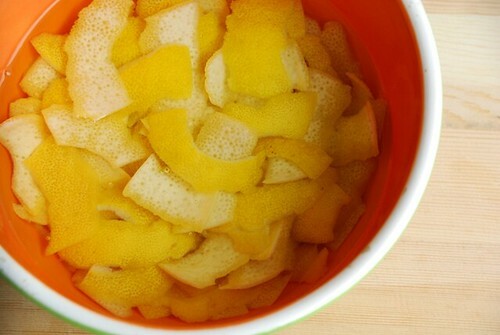 Soak lemon and orange peels in a bowl filled with pure alcohol, and cover with a plate for 48 hours. Strain alcohol, and discard peels. 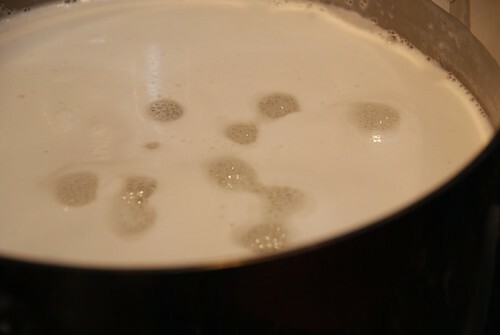 In a very large pan, mix milk, sugar, whiskey, and vanilla. Bring to a boil. Lower the heat. The liquid should bubble as shown above. Keep stirring, and don't take your eyes off of it. If left unattended, it will overflow. Trust me. Then it will take you hours to remove the impossibly sticky lemon mixture off of your stove top. You'll curse me forever, and I couldn't live with the guilt. Once cooled, you will see a thin film form on the top of the liquid. Pour the limoncello through a sieve. Pour into bottles and freeze. Sit back, put your feet up, and enjoy a glass of refreshing chilled, creamy, limoncello. You deserve it. Update: July 9, 2010: Lately my dad has been soaking the lemon and orange rinds for 1 week, which imparts a more pronounced lemon flavor. The 48 hour soak is still delicious, but it's another option. 1. In a large bowl place lemon and orange peels. Pour pure alcohol over the peels. Soak for 48 hours on the counter top. Note: It's helpful to place a plate on top of the peels so they don't float to the top. 2. Strain lemon and orange alcohol; discard peels. 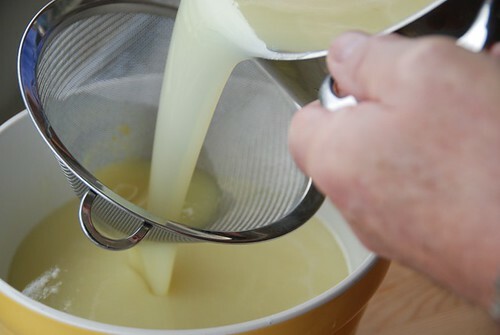 Pour alcohol in a heavy bottomed large saucepan and add milk, sugar, whiskey, and vanilla. Bring to a boil, then reduce until just bubbling, for 5 minutes. Stir continuously, and keep a close eye on it so it does not boil over. Remove from heat and let cool completely. A thin film will form on the top of the limoncello. Using a large spoon, skim it and discard. Then pour limoncello through a fine mesh sieve. 3. Pour into bottles and freeze. Note: We use plastic containers, which are safer to handle than glass. Keep in freezer at all times. Shake before using. 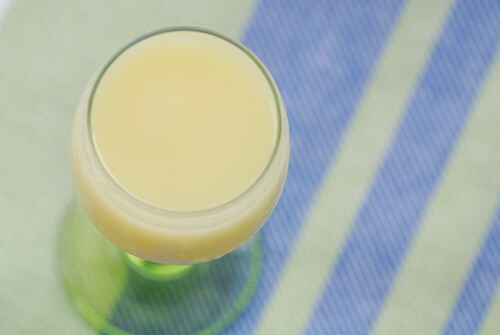 I've never had a limoncello with milk in it--sounds tantalizing! I've also never made it with milk...how long does it keep in the freezer? I can't imagine anything with milk lasting too long, but it sounds very intriguing and defnitely not as time consuming as my last attempt...which took 4 months. Can't say I've ever had a limoncello made properly. Thanks for sharing another one of your family recipes. I love limoncello!!! And the good thing is that I always have tons of lemons around! Thanks to your dad for sharing! I have a bottl of lemoncello hubby bought when he went to Rome. Didn't know we could make them home. An Italian classic. Very nice. It's also great to pour a little into a glass of Prosecco. There's so many uses for this. . .! FIVE pounds of sugar! Oh my goodness! LOL This *has* to be good! Ooo yummy! My stepdad has made limoncello but not a creamy one like this. rosa-But then you'll end up having it again b/c it's irresistible! kristen-The milk makes it delightfully creamy. anna-I'm still working on a bottle we made in Feb. It'll last for months. jude-This is one treasured family recipe. mark-Really? It's hard to come by? Didn't know that. parita-He'll be glad that he introduced it to you! happycook-Yup! Then you'll always have it! lydia-I miss the Del's truck! Last summer I attended a party where limoncello was served and it was so refreshing and delightful. Love the recipe! I have to agree with my sister-in-law when she says that her dad makes the best limoncello. There is nothing better than having an incredible meal at her mom and dads and then ending the night with this tasty treat. This drink is especially wonderful on a hot summers night relaxing with family and friends. Ok, now I know how you survive way over there in California without Del's lemonade. Haha! I'm buying everclear this weekend. That will be really useful, Susan - tks for sharing! what a gorgeous drink to beat the heat in here!! love love it! Susan I've seen many recipes for this but yours is the first one that makes me seriously consider it. I know I love the stuff. Oooh this sounds really good right about now. Do I have to wait for 5:00?? Wow, that does look easy. I love anything lemon so will have to try this soon! 1.In Washington State I don't think Everclear or a reasonable substitute is available. 2. Does it matter what kind of whiskey we use? 3. 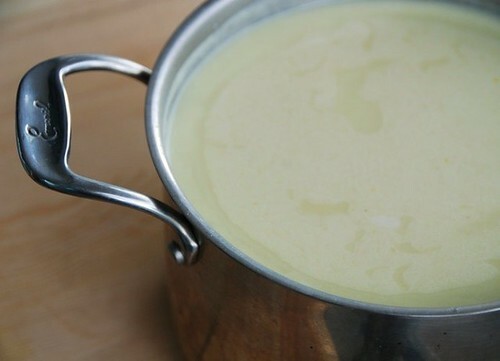 Can the vanilla be added AFTER cooking the milk mixture; is it really important to cook it? My thinking is the flavor would disappear with cooking. I made my own limoncello once but it had no milk in it-sounds like a sort of pina colada. My recipe: A bottle of 90 % spirits-some people use vodka. Next you must get the peel off of a dozen lemons or so and, this is important, get off as much of the white part of the skin as you can as this can lead to bitterness. This is a real pain in the neck and took me a long time. The peel is added to the liquor and a glass container- This mixture sits in a dark, cool place for 40 days, rather like Noah. I marked my calendar and removed the mixture at the end of the time and it had turned a lovely yellow color. Then you make a sugar syrup with 4 1/2 cups of sugar and 5 cups of water that boils for 5 minutes, gets cooled down and then added to the lemon mixture. At this time-I misread the recipe-you add another bottle of the alcohol. Then it is another 40 days into the closet. Take out the peels and strain the mixture and put it into cute bottles. I didn’t have any cute bottles so I reused the alcohol bottle and a couple of wine bottles. Good stuff. kate-There's nothing like it on a hot summer night. notquitevegan-Please, do let me know! dhanggit- It'll definitely keep you cool. tanna-I really do hope you try it. It's amazing. ben-I really hope you do! william- 1. Any pure alcohol will do. 2.Nope, any whiskey. 3. I understand your concern. Either way is fine. You don't really taste the vanilla much anyway. Linda-Wow! 80 days? I haven't heard of one that takes quite that long. I'm sure it's wonderful, but I like the quick method. Then I don't have to wait as long to drink it! :) Thank you so much for sharing your version with us. pille-That's b/c it's so delicious! I adore Limoncello and I've had the creamy version you're showcasing here. I also noticed you used Crown Royal Canadian whiskey...any alcohol will do? Thank you so much for this recipe!! I just finished making it last night and it's just incredible! i'm looking forward to having some tonight. Thank you Papa Food Blogga! I love this recipe, my daughter and I plan to make this together very soon. I love the creamy version. We can't wait to sip this over the summer!! A tall glass of Limoncello in a hot summer day is a heavenly drink. Not only it is rich in taste and flavor but also is very filling. I love thing tropical drink as your recipe. I made this to have ready for Easter (all 8 gallons lol), and what a hit it was! ABSOLUTELY DELICIOUS! By far the best limoncello we've ever had. I soaked meyer lemon peels in the grain alcohol for a month and what a delicious flavor it gave! Thank you SO MUCH for sharing your family recipe, it will now become an Easter tradition for our family :). mrscars-I'm so happy you and your family loved it and feel honored that it will become an Easter tradition. I just spoke with my dad on the phone and he said maybe he'd try the longer soak in the future. Cheers! A word of caution that this mixure is extremely flammable! Keeping a close eye on the bubbling pot is not sufficient if the pot isn't large enough to accommodate the rapid increase in volume as it reaches a boil. We had not just a sticky mess to clean up but nearly lost the whole kitchen as the mixture suddenly overflowed, caught fire on the gas burner, and spread. Use a pot twice the volume of the ingredients, keep a box of baking soda handy, and as Susan says, don't let it out of your sight for a second. anonymous-I'm glad you're OK! That's why I say to keep a close on it. I honestly have never experienced anything like what you described, but thank you for sharing your story. I've never had Limoncello before, but it's yummy! It tastes almost too sweet, but maybe that's because it's not cold yet? Also, I had a problem with curdling. I didn't have a very good fine mesh sieve, so I used cheese cloth and strained a bunch of times. It's finally pretty smooth & creamy...yuuuum! Thank you for sharing! Could others who have made this recipe describe about how strong it tastes? I assume some of the alcohol is burned off during cooking, but I'm curious to know about how much. anonymous-Since you're using pure alcohol, it doesn't just burn off. There is definitely kick in the final product, but it's not overly strong. Hi there! I've been soaking my lemons for about a week, but the alcohol does not look yellow. I had to use 100-proof vodka b/c they don't sell EverClear in PA. Any idea? It smells lemony but no color. Do you think I can add a drop of food coloring? I'd like to make the mixture this weekend for holiday bottles. I'm increasing the recipe 2.5 times and giving lots of gifts. PS: I make your orange cauliflower mac and cheese all the time! robin-Some batches are really pale yellow; it just depends on the lemons. I have never added food coloring, but I can't imagine it would hurt it since it's flavorless. I say try it! And I'm so happy you love the orange cauliflower mac n cheese! Thanks for letting me know. Turned out beautifully! It ended up being a very pale yellow and the bottles look great. I didn't add food coloring. Thanks so much! My wife and I made limoncello from a recipe that was given to us by her great aunt. It involves an 80 day process! Your dad's recipe has some different ingredients and the addition of milk in that other version is really interesting. I'll have to try that. How long will it last out of the refrigerator/freezer? rosegarden-Indefinitely once it's frozen. The alcohol helps preserve it. If you kept it the fridge only, then I'm not sure to be honest, but I'd think a long time. I just made this and it is AMAZING! I thought 10 cups of Sugar was way too much, but its not. The vanilla and the whiskey give it depth. Mine turned out beautifully yellow and devine. I zested the lemons and oranges, it was easier to avoid the white pith that way, and I didn't need a plate to hold them down. I also soaked them for about 3 weeks give or take, the peels were almost white. I was so freaked by the comment about boiling over, so I used a candy thermometer(it boils at 180 degrees). It was not big deal, just stir, stir, stir, and make sure your pot is big enough. Mine was not, so I brought it all to about 170 degrees, poured half into another pan and just finished it off in two batches. Anyway, Cheers! This will be an annual (or bi-annual) recipe in my house! Thanks, Food Blogga! Looks good enough to die for. I have made limoncello before but never with milk, whiskey, or vanilla. One quick question, when you cook it, doesn't it remove the alcohol content in it? anonymous-I know it seems like it should, but it doesn't.